If it feels like people around you are spending more time glued to a mobile device than ever before, it’s because they are. eMarketer estimates US adults have trimmed traditional media time and upped their mobile time considerably. US adults will spend 12 hours, 7 minutes per day consuming media across all channels and devices in 2017, up 13 minutes from 2013.
eMarketer estimates US adults will spend 3 hours, 17 minutes a day using a mobile device this year. US adults will spend the largest share of mobile time listening to digital audio: 35 minutes via apps and 21 minutes via mobile websites. Mobile video viewing time will skew more heavily toward apps, with US adults spending 20 minutes daily in apps vs. 11 minutes per day via mobile websites. Nearly all mobile social networking time will be spent inside apps. US adults will spend 26 minutes per day with social network apps vs. 5 minutes a day social networking via a mobile browser. The average US adult will spend 23 minutes a day playing games via mobile apps and 9 minutes a day using chat apps. 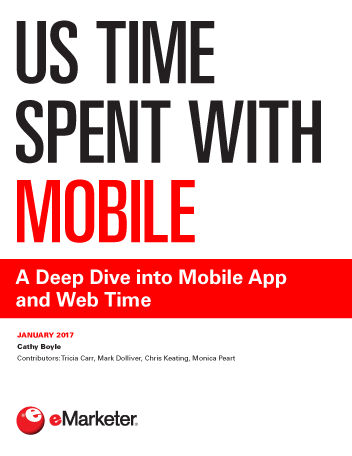 US adults will spend 2 hours, 41 minutes per day using apps in 2017, compared with 34 minutes a day using mobile websites. Five trends will influence the amount of time US adults spend on mobile’s two media channels: efforts to make the mobile web faster and slicker, messaging apps evolving into platforms, retailers investing heavily in mobile advertising, the rise of mobile video viewing and upgrades to smartphone operating systems. "The average US adult will spend 3 hours, 17 minutes each day consuming media on a mobile device in 2017, an increase of over 1 hour since 2013. Meanwhile, time spent with all other major media has declined."